As I’ve mentioned previously, every month I have a new activity to focus on trying. I learned about my food allergies and my atypical celiac disease this summer in the midst of . . . well, a lot going on in my life. So when I was setting up my activities for each month, I picked December to devote time to developing the ability to bake allergen-free (soy-free, egg-free, casein-free), gluten-free foods. I meant to bake my kick-off cookies tonight, and then I realized that I had forgotten to ask my husband to pick up almond meal for my cookies in his trip to the grocery store. After dinner, I settled down to listen to Christmas cds (awesome ones my friends Nikki and Terri made me) while reading some of your lovely blogs. But I felt restless. 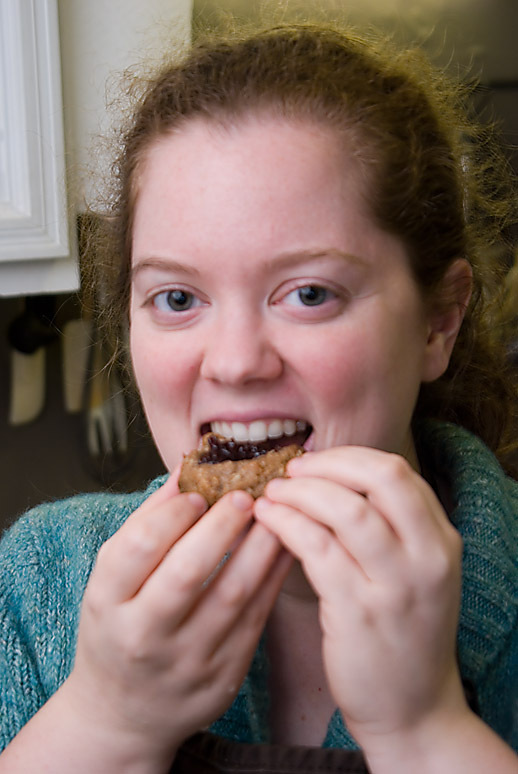 When I got to Meg Wolff’s vegan linzer cookies, I couldn’t take it anymore. I had to try my first recipe for my allergen-free baking month! Pecans, I realized. Pecans might be my saving grace. I started out following my almond cookie recipe using pecan butter and pecan meal instead of almond meal and almond butter. But the pecans were more moist than the almonds would have been, and I soon abandoned the recipe and just let my intuition take over. Sometimes my kitchen intuition serves me well, and sometimes my intuition leads to a smoking mess in the oven and a pan that’s dastardly hard to clean. Fortunately, in tonight’s case, the former was true. Mix together all the ingredients except for the last one. Taste dough to check salt level, adding more if desired. Press a dent into the center of each cookie. Fill each dent with preserves. See how pleased I was? Each cookie is a bite of PB&J tasty goodness. I had a few good bread recipes that I used that were gluten-free, one a French bread and one a cinnamon swirl. The cinnamon swirl had to be toasted to be good. I will have to look those up! The vegetables below look so good!!! looks really yummy Sally!! I love thumbprint cookies! What a creative recipe!! Mmmmmm…. they look so tasty! I’ve found that egg replacer generally works ok for bread recipes that only need one or two eggs. I’m anxious to hear about your results! Oh my heck those look delicious! I’m planning a cookie-baking-date with a friend, and these might have to be on the menu. I have to remember this recipe. That sounds awesome! There is a recipe for flatbread on my blog, elsepeth27.blogspot.com that is really tasty. It’s wonderful right our of the oven, makes good sauteed croutons, and is great warmed or tasted for several days. I don’t use eggs either, I substitute with potato starch because the one egg replacer I found had cornstarch in it, and I’m allergic to corn too. Kate at Gluten Free Gobsmacked has a GF biscuit recipe that is really good (and quick) too. ooh, I love how hearty and sweet those cookies look all at once! I haven’t seen pecan butter in stores I will have to keep an eye out. Thanks! Those look really good! I want to do some thumbprints with fig preserves. is a vegetarian and post awesome looking recipes too. She is NAG friendly. Thanks so much for your comment on my blog and so nice to “meet” you! Yours looks great to me. I’m so glad my first visit fell upon COOKIES! It seems we do indeed have similar plans and approaches to eating/dieting. I’m looking forward to reading more from you. Lovely job on the thumbprint cookies. I love your use of pecans…must be the southerner in me. Beautiful photo! And those cookies look fab. Mmm…. Wow ! Gluten free and vegan thumbprint cookies ! Thumbprint cookies were my very favorite cookies as a kid. And a great idea to use pecans. They have such fantastic flavor. 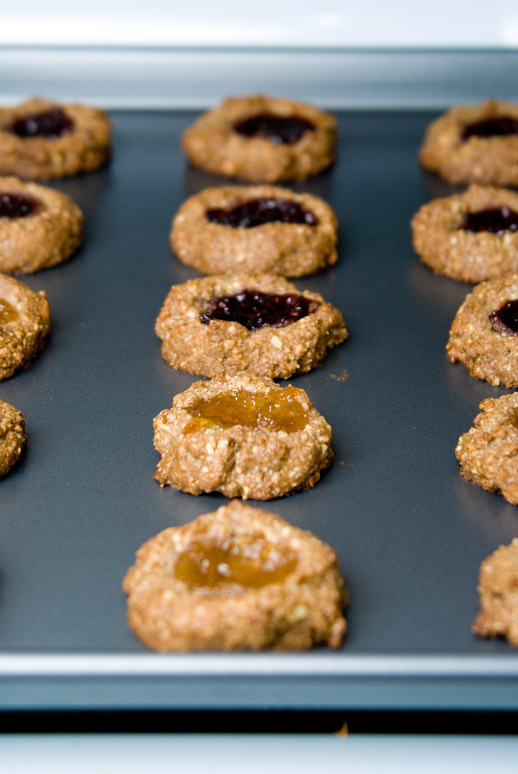 Those look just as good as my mom’s allergen-full thumbprint cookies! Hooray! As for using pecan-related supplies? Brilliant improvisation! I’ve been obsessed with salted pecans lately, so your cookies sound EXTRA delish. If I lived anywhere near Georgia I’d be hunting you down. What does teff taste like? Hmmm, that’s a difficult question, because I’m not sure what to compare it to. It’s richer in flavor than wheat; nuttier isn’t right, but that would be an approximation. Texture-wise, it’s a bit … grittier isn’t the right word, exactly, but something to that effect. Rougher . . . a bit more like graham crackers or ginger snaps ground into flour would be than anything else I can think of. It’s good, in my opinion. Dan and I will eat cookies made with teff flour alone, which is saying something for a gluten-free flour. If you want to try teff without buying any, visit an Ethiopian restaurant and eat some injera (the flatbread that usually comes with meals). Of course, check to see if the restaurant’s injera is free of any restrictions you have. Gluten-free baking—using all the flours—in my experience, at least, just requires getting in there and playing with things and seeing what happens. Doing that helps give you a sense, over time, of how to combine things to get the feel you want. At least for me (maybe this isn’t universal), it’s harder to do that with anything other than getting your hands into it, baking it, and seeing what happens. Lovely! I’ve almond meal and almond butter, so it sounds like I might need to be adding some moisture to the recipe, but I am really looking forward to giving these a try!